German rabbi; born in Hamburg Oct. 8, 1814; died in Fulda Dec. 31, 1876; attended the Johannæum in Hamburg and the Talmudic lectures of Ḥakam Isaac Bernays, entered the University of Würzburg, and also became a pupil of R. Abraham Bing. He obtained his Ph.D. degree at Erlangen. He continued his Talmudic studies with L. Bodenheimer in Hildesheim, and R. Rohmann in Cassel; and founded in Altona a Jewish secondary school (Bürgerschule), which continued under his direction until he became (1855) rabbi of Fulda. 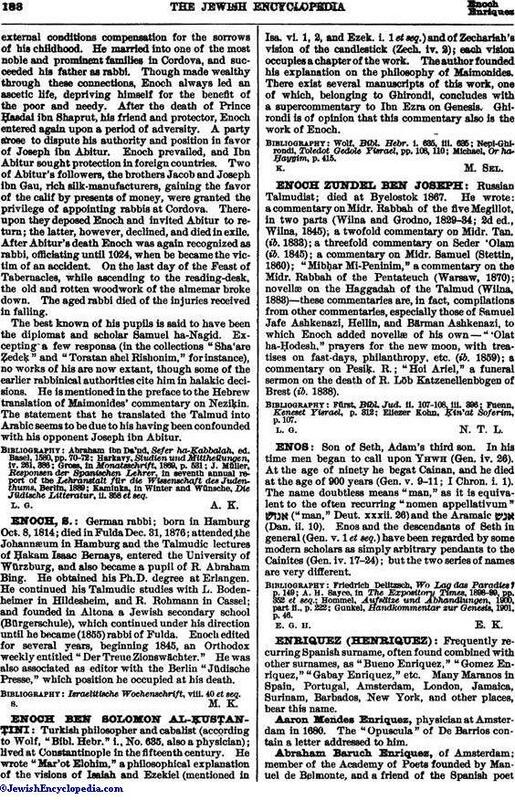 Enoch edited for several years, beginning 1845, an Orthodox weekly entitled "Der Treue Zionswächter." He was also associated as editor with the Berlin "Jüdische Presse," which position he occupied at his death. Israelitische Wochenschrift, viii. 40 et seq.